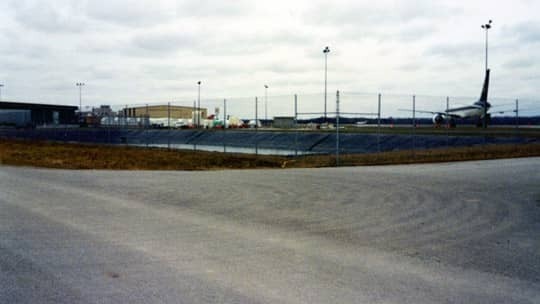 6,000 square feet of 8130 XR-5 geomembrane is used to line the deicing chemical runoff pond at Lansing Regional Airport. The regional airport in Lansing, Michigan needed a runoff pond to handle its glycol de-icing spill off. This pond is lined with a 60,000 square foot liner made with 8130 XR-5® geomembrane. The XR-5 easily handles thermal temperature swings common to this location, plus it needs minimal maintenance and is resistant to hydrocarbons which also enter the impoundment.